Antique Radio Forums • View topic - How is this possible? Post subject: How is this possible? 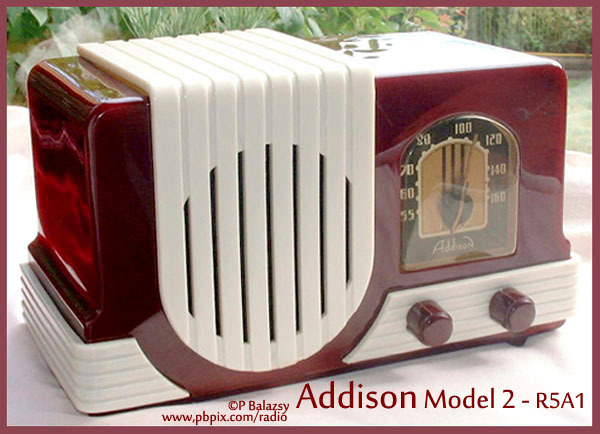 I am bidding on an Addison radio ... it's my first time participating in an online auction (other than ebay). I am totally puzzled because the same radio (with the same paint variations) seems to be on auction on two different sites with two different bid amounts at the same time. I discovered this quite by accident. Does anyone know if these sites are legitimate? If not, what should I do? Any advice would be greatly appreciated. Post subject: Re: How is this possible? Looks the same one to me. I have one also ( a beauty) ... I paid $500 + $30 shipping about 10 years ago. I think it is made of Catalan plastic. To be a man, Be a non-conformist, Nothing's sacred as the integrity of your own mind. I would contact each auctioneer, post the other's auction, and ask them what gives. One of them has already copped that it's not Catalin, so the "estimate" from Morphy of $300 - $400 is a pipe dream. Last edited by fifties on Feb Tue 06, 2018 6:51 am, edited 1 time in total. Yes, I have written to them both. Something isn't right at all yet they appear to be well known auction sites. @ Peter: Your Addison radio is STUNNING! The way I see this is that yes, both auctioneers are legit, but the seller isn't. He listed it on two auction sites, and guess which one he'll actually acknowledge; why the highest bid of course. The other will get "item no longer available". I'd steer clear; these sets are not that uncommon. It's sooo beautiful but since I cannot display more than a cpl radios at a time around my living room this beauty remains hidden in another glass front lawyer book shelf in my basement office. I have too many hiding like that. In the early days of my collecting in 2005, I bought a bunch of costly beauties like this... but eventually realized that I get more fun out of rebuilding old non-working radios. These remain as shelf queens.... but they work better than new. Maybe the seller or sellers are dishonest and not supplying the REAL radio pictures but only a sample of a same-model radio stolen from the web somewhere. If that's true... the buyer will not get the pictured radio... but only get one that "looks" like that. Both websites say the item is at Morphy Auctions in PA, so I don't really see the problem. Same radio, one auction, two sites collecting bids. Apparently they don't reconcile their bids with each other in real time. My guess, liveauctioneers.com is a proxy website. They collect bids that they turn in to Morphy at some later time, like during an actual live auction segment on the day of the show. The fundamental auction rule is unchanged: Highest bid wins. I once saw a listing for a rental home I own "for rent" on Craigslist. It was already occupied, they had copied an earlier listing partially. It was clearly a forgery, I reported it and away it went. BUT, had I not, I wonder if the fraudster (probably in some other land) could have collected a deposit. And, how long the ad could have stayed up. The Addison radios shown, including Peters are NOT Catalin. They are plastic. I have one myself and it looks like Peters maybe has clearcoat on it or some other "shined up" product. The radios normally don't shine that much, they are actually dull. Here is mine. @ Tony: Thank you SO MUCH for letting me know. It is very kind of you. I like the non-catalin radios too. I just prefer they be original. I don't like "restored" radios. They don't have to work. @ Tony: I cannot see yours. Just the other one you posted. As mentioned above its all one auction, check lot # 536, that's what you go by. Bidding will be upgraded as they come in and it most likely will be online to watch that day. Auctionzip.com will find any auction by giving them the name of the auction house. And yes some like the high shine which is man made, its like who has the shinyist pair of shoes looks the best. If you look at the white piece of trim (to the right of the knobs) you can see a crack in the "tenite" (plastic) trim. It appears as a whiter strip, running on an angle between the 2 indentations , these auctions are the same radio. If you hover your mouse on the photo it shows up pretty clearly. There is also the start of a crack at the corner (where the top and front meet) of the "waterfall" on the left hand side. Also, the middle indentation at the bottom of the waterfall has a crack where the screw secures it from the backside. Also, looking at the rear photo the white plastic trim piece that has the knobs in it, is missing the screw on the inside. That means it is floating loose on the back corner and could get caught and broken off, if not aware of it. The "tenite", plastic trim is EXTREMELY fragile on these sets. I think the bright shiny look is primarily because of the very bright sunlight shining on the radio in that photo. In regular room light it doesn't look so bright. @ Tony: WOW!!! Thank you so much for spotting those flaws. I see what you mean. I have already been outbid so I won't pursue this radio anymore. You have saved me from disaster!!! @ hoffies2: I agree with you. Trouble is there are so few available here in Canada. So the chances of my ever seeing one in person for sale here are very very slim.